Delhi University offers two very good courses related to economics at undergraduate level. Both the courses are of three year duration. While admission to BA Eco Hons is through the class 12th marks one has to appear for an admission test for admission to BBE. For both BA Eco Hons and BBE, English and Mathematics at class 12th is compulsory. Both the courses lead to many good career options. Like after BBE you can go for MBE or can go for MBA in finance or can go for Masters in Finance and control (MFC offered by Delhi University). After Economics Hons you can go for career as an economist after taking MA in economics or can go for MBA. You can also go for teaching and of course finance field is also open for you. Here is a brief comparison of various courses that you will have to do as part of the courses at Delhi University. As you can see from the above comparison both are well designed courses and offer a lot of things to learn in the field of economics. 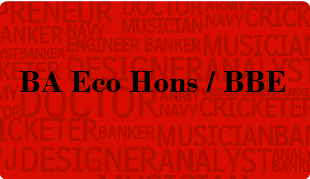 BA Eco hons covers more papers related economics and has a lot of theoretical papers as well. BBE course on the other hand is more focused on application in business scenario. A word of caution. Before you choose any of these courses you must see how well your aptitudes match in this field. As aptitude helps you to learn and will help you perform better in your future job. Good Luck ! !